MIYAZAKI, Jan. 1 – Foreign tourists visiting rural areas in Japan are on the rise. As the Japan National Tourism Organization statistics show, the estimated number of foreign visitors to Japan topped 30 million in 2018, and repeat visitors is also increasing. 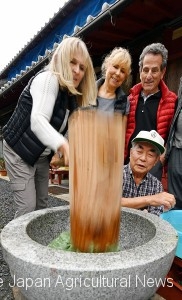 Foreign tourists with a clear intention to have deeper experiences in Japan are traveling to the countryside to enjoy nature, the unique landscape, tradition, culture and local specialties. 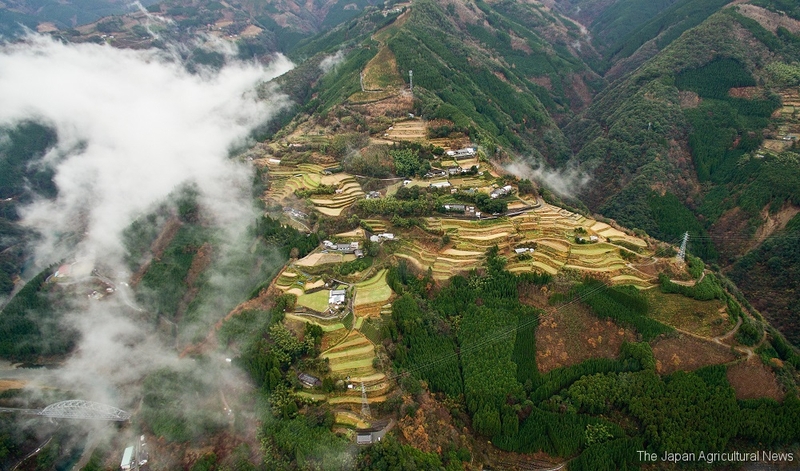 An aerial photo taken with a drone shows Sennin no Tanada, rice terraces in the village of Shiiba, Miyazaki Prefecture. Shiiba, a village in Miyazaki Prefecture, is recently attracting foreign visitors with Sennin no Tanada, meaning rice terraces of the hermit. Also referred to as the Machu Picchu of Shiiba, because of the resemblance of the landscape to the Inca citadel in Peru, the 4.1-hectare rice terraces created about 150 years ago continue to be cultivated by 14 farms. The place had been little known among foreign visitors, but many tourists began to come after it was designated a Globally Important Agricultural Heritage System by the United Nations Food and Agricultural Organization in 2015. Currently, around 200 people, mainly from the United States and Europe, visit the area annually. A tourist pounds steamed rice in front of a farm in Otsu, Shiga Prefecture. In Otsu, Shiga Prefecture, many foreign tourists are attracted to a tour designed to interact with local farmers and get a peek into their lives. Two couples from the U.S. and Canada were pounding steamed rice using a wooden mortar and a pestle to make rice cakes at a local farm, along with a call “Yoisho!” from a 77-year-old rice farmer Yoichi Kosaka. The tour, launched by a local travel agency BSC International in 2014 with nine different courses available, has attracted a total of 1,400 people by November. Tasting rice cakes fresh from the mortar, Johanna Donnenfield, a 72-year-old nutritionist from Arizona, said this is the kind of tour she was looking for. She said the pestle was heavy, but she didn’t feel tired. Rice cakes were rich in sweetness of rice, she added. A tourist from Taiwan dressed as Namahage deity poses for a photo in Oga, Akita Prefecture. Namahage Museum in Oga, Akita Prefecture, which exhibits Namahage – a local folk ritual in which men dress up as gods, wearing demon-like masks and straw capes, and visit homes – is one of the popular tourist sites for foreign people visiting the Tohoku region. The number of foreign visitors to the museum has constantly been increasing since it opened in 1999. Around 2,000 foreign people visit the place in a year, mainly from Taiwan with increased charter flights to Akita Airport. 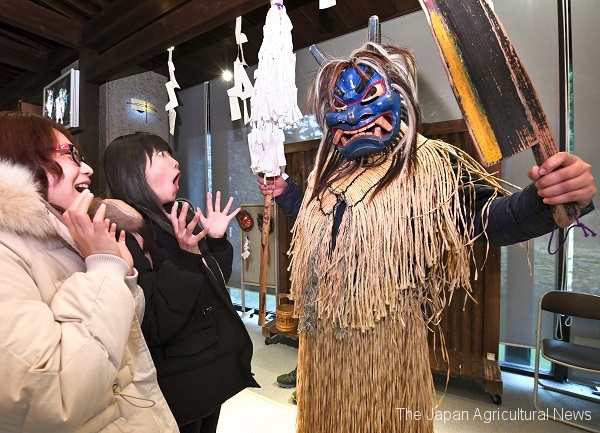 Foreign tourists appear excited to try putting on the masks and capes and take pictures of themselves dressed as Namahage, which was added to UNESCO’s Intangible Cultural Heritage list in November. 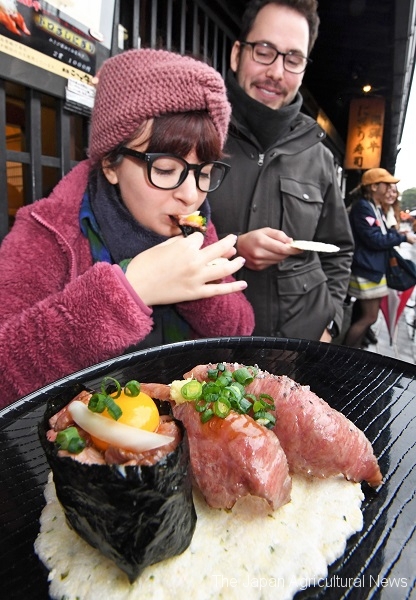 A Mexican tourist tastes wagyu sushi in Takayama, Gifu Prefecture. A combination of wagyu and sushi – two of the most well-known Japanese dishes – is proving popular among foreign tourists visiting Takayama, Gifu Prefecture. A local restaurant Hida Kotte Ushi offers lightly broiled Hida beef – the beef produced in Gifu which is graded the highest in terms of quality – in a form of sushi served on senbei rice crackers. A 31-year-old Mexican man who was visiting Takayama on vacation said he was looking forward to the visit because he was told by his friend that the place is a wagyu producing region. As he tasted the wagyu sushi, he said he felt the pride of the wagyu producer. His 31-year-old wife said the beef fat melts and spreads in the mouth and its flavor is rich as butter. The restaurant sells as many as 2,000 servings of wagyu sushi a day at the most, out of which 60 percent are served to foreign visitors.